Although ion fluxes are considered to be an integral part of signal transduction during responses to pathogens, only a few ion channels are known to participate in the plant response to infection. CNGC4 is a disease resistance-related cyclic nucleotide-gated ion channel. Arabidopsis thaliana CNGC4 mutants hlm1 and dnd2 display an impaired hypersensitive response (HR), retarded growth, a constitutively active salicylic acid (SA)-mediated pathogenesis-related response and elevated resistance against bacterial pathogens. Barley CNGC4 shares 67% aa identity with AtCNGC4. The barley mutant nec1 comprising of a frame-shift mutation of CNGC4 displays a necrotic phenotype and constitutively over-expresses PR-1, yet it is not known what effect the nec1 mutation has on barley resistance against different types of pathogens. nec1 mutant accumulated high amount of SA and hydrogen peroxide compared to parental cv. Parkland. Experiments investigating nec1 disease resistance demonstrated positive effect of nec1 mutation on non-host resistance against Pseudomonas syringae pv. tomato (Pst) at high inoculum density, whereas at normal Pst inoculum concentration nec1 resistance did not differ from wt. In contrast to augmented P. syringae resistance, penetration resistance against biotrophic fungus Blumeria graminis f. sp. hordei (Bgh), the causal agent of powdery mildew, was not altered in nec1. The nec1 mutant significantly over-expressed race non-specific Bgh resistance-related genes BI-1 and MLO. Induction of BI-1 and MLO suggested putative involvement of nec1 in race non-specific Bgh resistance, therefore the effect of nec1on mlo-5-mediated Bgh resistance was assessed. The nec1/mlo-5 double mutant was as resistant to Bgh as Nec1/mlo-5 plants, suggesting that nec1 did not impair mlo-5 race non-specific Bgh resistance. Together, the results suggest that nec1 mutation alters activation of systemic acquired resistance-related physiological markers and non-host resistance in barley, while not changing rapid localized response during compatible interaction with host pathogen. Increased resistance of nec1 against non-host pathogen Pst suggests that nec1 mutation may affect certain aspects of barley disease resistance, while it remains to be determined, if the effect on disease resistance is a direct response to changes in SA signaling. To date, numerous lesion mimic mutants (LMM) have been characterized in Arabidopsis thaliana, rice and maize [1, 2]. Frequently, LMM display enhanced disease resistance, constitutive expression of pathogenesis-related responses and an altered hypersensitive response (HR). Molecular mechanisms triggering the onset of cell death underlying the lesions mimic phenotype might have common features with HR-associated cell death observed during pathogen infection . Although a direct link between HR and plant disease resistance is often questioned [3, 4], it is evident that LMM can clarify numerous aspects of plant-pathogen interactions at the molecular level. Although several barley mutants with necrotic leaf spots have been reported , only very few LMM phenotypes of barley have been traced down to a particular gene. The best known examples of barley LMM are mlo [6, 7], and the recently characterized necS1 (HvCAX1) , which apart from displaying a necrotic phenotype also shows enhanced disease resistance against fungal pathogens. The barley mutant nec1 comprising of a mutated cyclic nucleotide gated ion channel 4 (CNGC4) exhibits the necrotic phenotype and over-expresses the pathogenesis-related gene PR-1 . A. thaliana CNGC4 mutants dnd2 and hlm1 which are orthologous to barley nec1 mutants display enhanced resistance to virulent bacterial pathogens [10, 11]. HvCNGC4 shares 67% aa identity with AtCNGC4 , suggesting that a similarly to dnd2 in A. thaliana nec1 mutation may affect barley disease resistance. Bacterial diseases of barley have been described, although the mechanisms of resistance have not been studied in detail [12, 13]. Apparently, there is no race-specific resistance to bacterial pathogens: thus, only PAMP-triggered immunity is operational, even though cultivar-dependent differences in infection rates have been reported for bacterial kernel blight caused by Pseudomonas syringae . Significant over-production of salicylic acid (SA) upon P. syringae infection in barley suggests that barley resistance to non-host bacterial pathogens is achieved through a SA-mediated defense pathway . Bacterial pathogens of Arabidopsis are commonly used as a model system for plant-pathogen interaction studies. However, fungal pathogens are the causal agents of economically more deleterious and widespread diseases in barley. Powdery mildew is caused by the biotrophic fungus Blumeria graminis f. sp. hordei (Bgh). This is among the best studied barley diseases, and extensive details are available on both the race specific or race non-specific powdery mildew resistance mechanisms . Race non-specific resistance of barley to Bgh is a cell wall-based resistance forbidding fungal penetration into a host cell . Penetration resistance is triggered by the ROR2 protein, presumably directing secretion vesicle trafficking to the fungal penetration site . Race non-specific penetration resistance is fully attained only in the absence of the trans-membrane protein MLO which is a negative regulator of ROR2 . Functional MLO protein employs Ca2+ and CaM signaling to ensure fungal penetration into host cells. Mutations negatively affecting MLO binding with CaM render barley more resistant against Bgh [19, 20], while overexpression of another trans-membrane protein, BI-1, counteract mlo-triggered Bgh resistance in a Ca2+ and CaM signaling-dependent manner [21, 22]. Although the interdependence of Ca2+/CaM signaling and race non-specific Bgh resistance in barley is well established, so far no Ca2+ permeable ion-channel has been shown to participate in Bgh resistance or susceptibility. Race specific resistance of barley against Bgh requires the presence of plant R-genes called Ml genes. In contrast to race non-specific Bgh resistance, race specific resistance usually permits fungal penetration into the host cell, but restricts further spread of the fungus by triggering plant cell death . Both types of powdery mildew resistance have been shown to incorporate reactive oxygen species (ROS) signaling elements, such as increased accumulation of H2O2 and/or superoxide [23, 24]. H2O2 acts as a principal signaling molecule initiating cell death during incompatible race-specific barley-Bgh interaction . Early accumulation of H2O2 in mesophyll cells underlying attacked epidermal cells is proposed to be critical for the establishment of race specific resistance [25, 26]. In race non-specific interactions, H2O2 plays a distinct role from that observed for HR induction. In mlo-triggered resistance, H2O2 most likely ensures host cell wall fortification, thus preventing fungal penetration [23, 27]. In this study, disease resistance of barley LMM nec1 mutants displaying necrotic leaf spots was analyzed. Although NEC1 has been shown to encode cyclic nucleotide gated ion channel 4 (CNGC4) and to over-express the defense-related PR-1 gene , the effect of nec1 mutation on barley disease resistance has not yet been characterized. This study shows that nec1 mutation triggers the induction of H2O2 and SA, restricts Bgh microcolony formation and affects non-host resistance against Pseudomonas syringae applied at high inoculum density, whereas it has no effect on Bgh penetration efficiency or mlo-dependent race non-specific Bgh resistance. The nec1 allele in cultivar Parkland was initially described as a natural mutation , which was confirmed by identification of a MITE insertion in an intron of the NEC1 gene that caused alternative splicing and a predicted non-functional protein . The nec1 mutant line GSHO 1284 and a parental variety Parkland were genotyped with DArT markers . Only 2.2% of 1131 DArT loci were polymorphic, suggesting that the mutant is essentially isogenic to Parkland (data not shown). All described experiments were performed with Parkland and its mutant nec1 accession GSHO 1284. As it was found that nec1 significantly over-expressed pathogenesis related genes , it was investigated whether nec1 plants spontaneously display also other SAR-related signals such as altered accumulation of reactive oxygen species and over-accumulation of SA Spectrofluorimetric analysis of whole-leaf extracts of two week old nec1 plants with a fully developed lesion mimic phenotype and the parental line Parkland showed a three-fold higher overall level of H2O2 in the mutant (data not shown). To ascertain whether the elevated overall amount of H2O2 in nec1 plants affected H2O2 accumulation during Bgh infection, overall H2O2 amount in nec1 and wt plants was assessed at 12 h and 36 h after inoculation with a virulent mixed population of Bgh. The analysis did not reveal considerable changes in the H2O2 content of wt plants during the first 36 h after inoculation, whereas nec1 mutants showed a slight, statistically non-significant increase in H2O2 levels at 36 h after inoculation (Figure 1). Time course of whole leaf H 2 O 2 accumulation in nec1 and wt plants after Bgh infection. 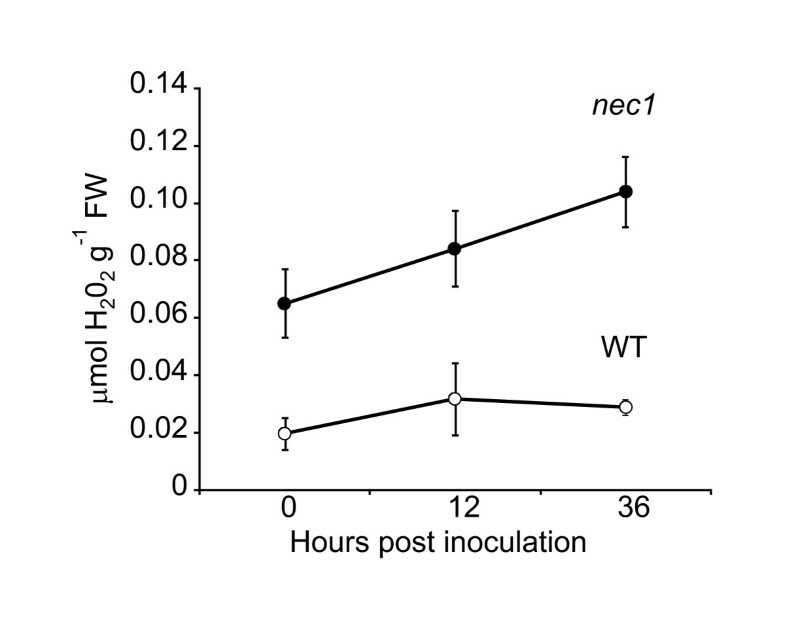 nec1 mutation triggers H2O2 over-accumulation in barley in the absence of pathogen infection, but it does not alter time course of H2O2 production in response to Bgh infection. Error bars represent the standard deviation of means (n = 5 per data point). H2O2 accumulation and PR-1 expression is known to be associated with SA-dependent signaling. Therefore, the SA content of nec1 and wt plants was also measured. 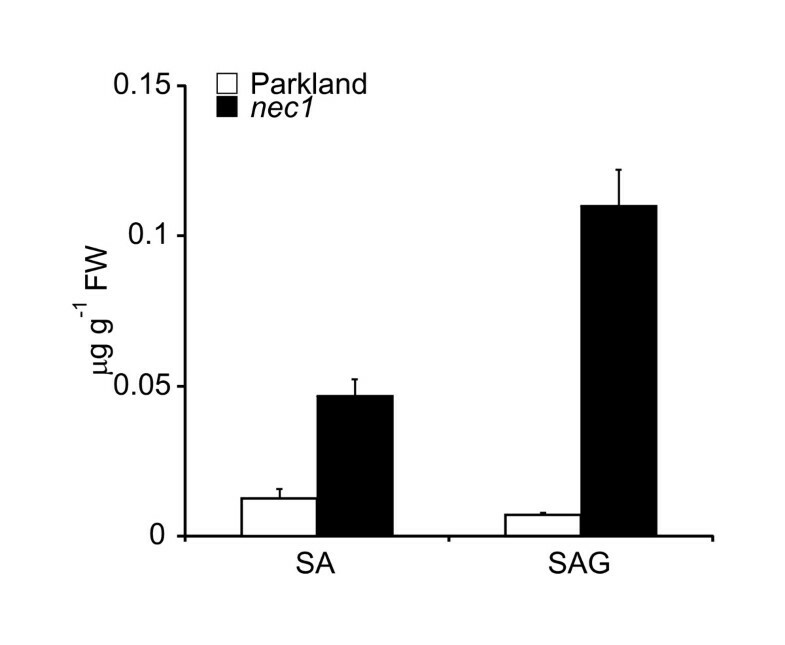 HPLC assay confirmed that levels of free SA and conjugated SA were four- and fifteen-fold higher, respectively, in nec1 than in wt plants (Figure 2). Level of free and conjugated SA in nec1 and wt plants. nec1 mutant contains significantly higher level of conjugated, as well as free SA compared to parental cv. Parkland. SA content was analyzed using reverse-phase high performance liquid chromatography in leaf tissue extracts of 14 day old plants. Average values from three biological replicates are presented, each consisting of three technical replicates. Error bars represent standard deviation. Barley resistance to the non-host bacterial pathogen Pseudomonas syringae likely employs SA-mediated defense pathway . Therefore, the constitutive activation of SA signaling in nec1 might contribute to its non-host resistance. nec1 plants were inoculated with P. syringae pv. tomato (Pst) at two inoculum densities - 8 × 104 and 6 × 107 cfu ml-1 using vacuum infiltration technique. At day 3 after infiltration with 6 × 107 cfu ml-1 of Pst the amount of bacteria in nec1 was reduced, whereas Parkland had accumulated ca. 6-fold higher amount of Pst making the difference in bacterial growth between wt and nec1 statistically highly significant (p = 0.01, Student's t-test) at this stage of infection (Figure 3A). Inoculation with Pst at lower inoculum density (8 × 104 cfu ml-1) did not reveal any differences in resistance between nec1 and wt plants (Figure 3A). Response of nec1 to non-host pathogen Pseudomonas syringae pv. tomato applied at low and high inoculum densities. Panel A. Growth of Pseudomonas syringae pv. tomato in nec1 and parental cv. Parkland was monitored immediately and 3 days after vacuum infiltration with Pst applied at inoculum densities of 8 × 104 or 6 × 107 cfu ml-1. For mock inoculation plants were infiltrated with 10 mM MgCl2. Infection was expressed as number of colony forming units (cfu) per gram of fresh leaves (FW). Due to the high between-experiment variation, results of one representative experiment out of four independent experiments are shown. Error bars represent standard deviation. At high inoculum density (6 × 107cfu ml-1) bacterial cfu number in nec1 at the day 3 was significantly (p < 0.01, Student's t-test) lower than in wt. Panel B. Progression of cell death in nec1 and Parkland after infection with Pseudomonas syringae pv. tomato in the experiment shown in panel A. nec1 mutation showed increased electrolyte leakage in barley inoculated with non-host bacteria Pst at 6 × 107 cfu ml-1. Measurements of electrolyte leakage were taken every two hours during 24 hour period and at 48 hours after inoculation. Error bars represent standard deviation. Ion leakage measurements were also performed to characterize the effect of Pst infection on nec1 and Parkland. 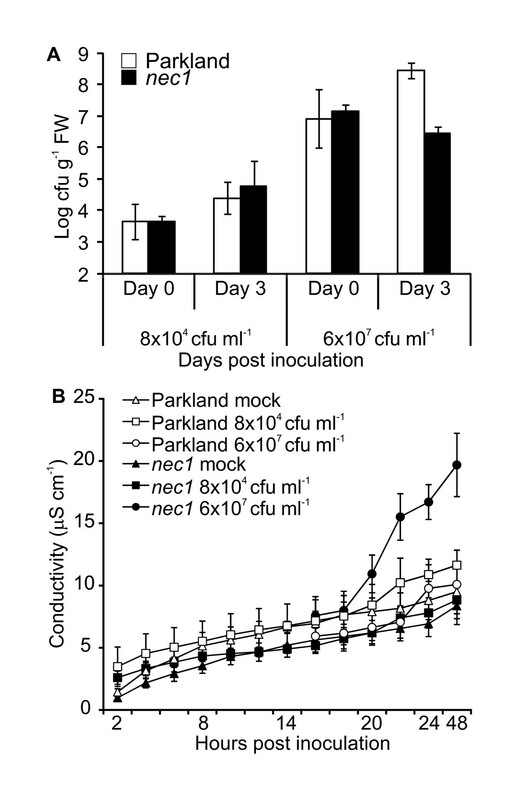 Vacuum infiltration with Pst at lower inoculum density (8 × 104 cfu ml-1) did not elicit cell death in either nec1 or Parkland (Figure 3B). In contrast to inoculation with lower Pst density, inoculation with Pst at 6 × 107 cfu ml-1 elicited differential response in nec1 and wt. Tissue samples from nec1 plants inoculated with Pst at 6 × 107 cfu ml-1 displayed more pronounced ion leakage suggesting an increased cell death in nec1 after infection (Figure 3B). Since nec1 plants exhibited constitutively active defense responses, the role of nec1 in basal resistance against Bgh was assessed. Due to their basal resistance, even susceptible barley cultivars are able to restrict infection to some extent. In order to assess the effect of nec1 mutation on basal Bgh resistance, microcolony formation was examined. nec1 supported formation of significantly (p < 0.001, t-test) smaller number of Bgh colonies compared to wt plants (Figure 4). To further test, if restricted formation of Bgh microcolonies on nec1 derived from the rapid and effective localized response precluding fungal penetration or from post-invasive defense impeding further fungal development, we examined nec1 Bgh penetration resistance. The effect of nec1 mutation on Bgh penetration resistance was characterized as the proportion of interaction sites that had formed Bgh haustoria to the total number of Bgh spores that had germinated at 48 hpi. nec1 plants permitted almost identical entry and haustoria establishment rate of Bgh as the parental line (71% and 74% Bgh penetration efficiency respectively, p = 0.64, Student's t-test). Bgh microcolony formation on nec1 and wt plants. Excised segments of barley leafs were inoculated with a virulent Bgh isolate. Microcolony formation was inspected microscopically 4 days post infection and infection rate was expressed as a number of microcolonies per cm-2 leaf area. Figure reflects data from two independent experiments. Error bars represent standard deviation. 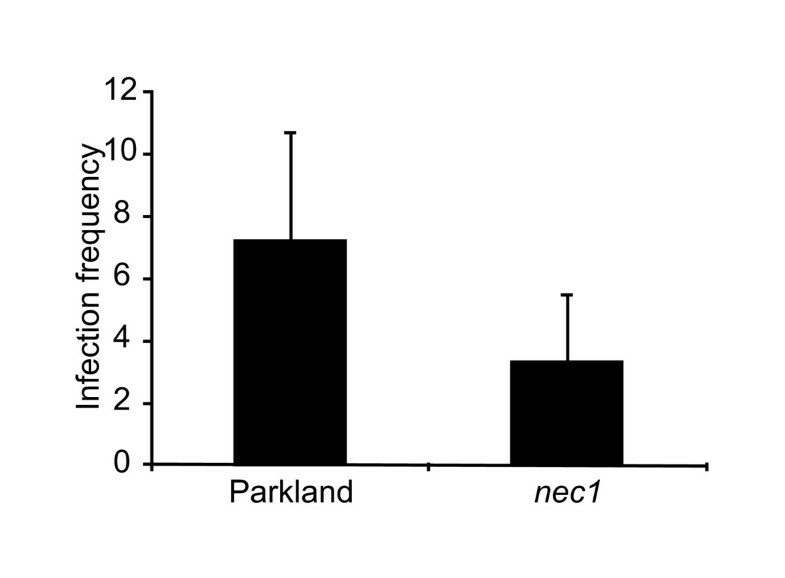 Infection frequency significantly differs between nec1 and Parkland (p < 0.001, t-test). Basal Bgh resistance has been shown to be tightly linked to the molecular mechanisms of race-specific Bgh resistance triggered by different Mla alleles [30, 31]. 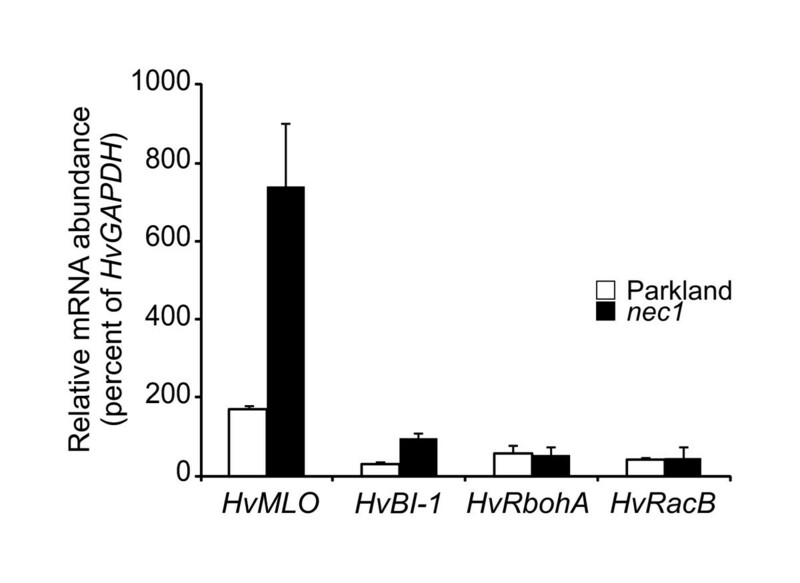 HvRbohA and HvRacB are known to participate in basal as well as race-specific Bgh resistance [32–34]. The expression of these genes was characterized using real-time quantitative PCR. Relative mRNA abundance of the analyzed genes was not affected by nec1 mutation (Figure 5) indirectly suggesting that nec1 may be independent from effector-triggered immunity that ensure rapid localized Bgh resistance. Effect of nec1 mutation on expression of powdery mildew resistance related genes. Transcript abundance of powdery mildew resistance related genes in nec1 mutants was determined by quantitative real time PCR. mRNA abundance of HvMLO and HvBI-1 is significantly increased in nec1. Error bars represent standard deviation. Different powdery mildew resistance types employ at least partially distinctive molecular pathways: thus, a particular gene can have a significant role in one Bgh resistance strategy, while having only a marginal or no effect on another Bgh resistance type . To find out, if nec1 mutation affected mlo-triggered race non-specific Bgh resistance, the expression of MLO and BI-1 genes was analyzed using real-time quantitative PCR. Loss of functional MLO protein renders barley almost fully resistant against Bgh, whereas BI-1 over-expression in mlo mutants leads to restoration of susceptibility against Bgh  and, in fact, BI-1 is required for full susceptibility of barley to powdery mildew . Furthermore, over-expression of MLO in wild type plants leads to super susceptibility against Bgh . 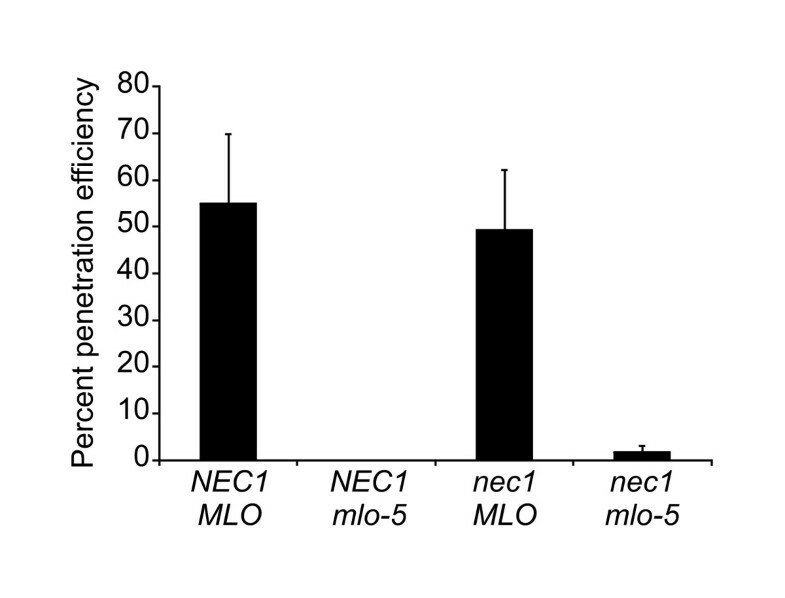 Significant over-expression of both MLO and BI-1 in nec1 plants was observed (Figure 5). To further test whether nec1 mutation had any effect on race non-specific powdery mildew resistance conferred by mlo-5 mutation, Bgh penetration resistance of nec1/mlo-5 double mutant was characterized. Similar to mlo-5 mutant, nec1/mlo-5 plants were almost fully resistant to Bgh, allowing establishment of fungal haustoria only at less than 2% of interaction sites (Figure 6). In addition, the H2O2 content of whole-leaf extracts from nec1/mlo-5 double mutants was analyzed. While the nec1 mutant showed markedly increased accumulation of H2O2 compared to wt NEC1 plants, the experiment did not reveal a significant effect of mlo-5 mutation on H2O2 over-accumulation in nec1 (Figure 7). Effects of nec1 mutation on mlo-5 triggered Bgh penetration resistance. Fourteen days old plants were inoculated with 10-20 conidia per mm2 and at 48 h post inoculation infected leaves were harvested and Bgh penetration efficiency was assessed. At least 100 interaction sites per variant were observed. Error bars represent standard deviation. Effect of mlo-5 mutation on H 2 O 2 accumulation in barley mutant nec1. 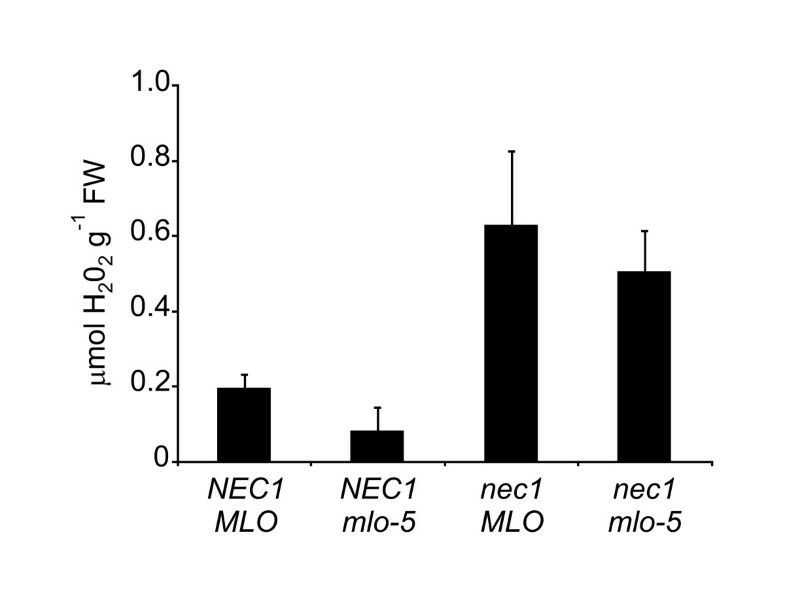 mlo-5 mutation does not affect over-accumulation of H2O2 in nec1 mutant. H2O2 content was determined spectrofluorimetrically in leaf extracts of wt, nec1, mlo-5 and nec1/mlo-5 double mutants. Error bars represent standard deviation. Despite the fact that ion fluxes are known to play an important role in early signaling events during plant-pathogen interaction [37–39], to date only several plant ion channels have been shown to participate in plant disease resistance or plant-pathogen interaction signal transduction. The cyclic nucleotide gated ion channel (CNGC) gene family is one of the best-represented among the disease resistance-related ion channels. CNGC mutants dnd1 (AtCNGC2), dnd2 and hlm1 (AtCNGC4) and cpr22 (AtCNGC11/12) exhibit a wide range of pathogen resistance [10, 11, 40, 41]. Mutations affecting AtCNGC4 enhance resistance of Arabidopsis thaliana against certain pathotypes of Pseudomonas syringae and Botrytis cinerea [10, 11, 42]. Although the effect of CNGC mutations on resistance against bacterial and oomycete pathogens is well-studied in Arabidopsis, little is known about the role of these genes in non-host resistance and also about the functions of CNGCs in disease resistance of economically important monocot plant species such as barley. Here we show that similarly to dnd2 in A. thaliana , nec1 in barley activates constitutive over-accumulation of SA. High level of SA contributes to enhanced disease resistance of dnd2 to virulent Pseudomonas syringae pv. tomato [10, 42] and this resistance requires functional PAD4 , which is one of the central genes in SA-mediated effector-triggered immunity (ETI)  and SAR . Although disease resistance pathways seem to be largely conserved among monocots and dicots [46–49], the position of SA in monocot immunity is ambiguous. Some monocots, such as rice, contain high endogenous SA levels  and SA is not required for PR-gene induction in rice upon infection . Ineffectiveness of externally applied SA on induction of PR-genes has also been observed in barley  and wheat , however, inoculation with non-host bacteria Pseudomonas syringae triggers SA accumulation in barley . Taking into account that such differences occur in the SA mediated resistance signaling among monocots and dicots, it is interesting to see whether mutation affecting SA mediated disease resistance in A. thaliana is also involved in barley disease resistance. The present study analyzed the effect of the nec1 (HvCNGC4) mutation on barley resistance against Pseudomonas syringae pv. tomato and Blumeria graminis f. sp. hordei. Mutation in the NEC1 gene affected barley non-host resistance against Pseudomonas syringae pv. tomato. Bacterial growth in nec1 plants was delayed at the initial phase of infection, if plants were inoculated with bacteria at high inoculum density. At the same time the increased electrolyte leakage suggested somewhat enhanced cell death, even though the conductivity values were much lower than reported for typical HR. Thus, electrolyte leakage data in nec1 were generally in agreement with the expected "defense, no death" phenotype characteristic of hlm1/dnd2 mutants, although differences between nec1 and hlm1/dnd2 mutants may exist in this respect. Non-host resistance is predicted to share common defense responses with host resistance - either basal (PAMP-triggered immunity, PTI) or ETI [53, 54]. The choice of which layer of immunity is activated upon a particular interaction with non-host pathogen seems to be case specific [55–57]. Therefore molecular mechanisms leading to changes in non-host resistance of nec1 to P. syringae pv. tomato might have also had an effect on interaction with host pathogens. This prompted the assessment of the role of nec1 mutation in resistance to powdery mildew caused by the fungal pathogen Blumeria graminis f. sp. hordei. nec1 restricted Bgh microcolony formation, while not affecting Bgh penetration or mlo-5 triggered resistance to Bgh. Interestingly, despite the fact that nec1 did not impede mlo-5 mediated race non specific resistance to Bgh, MLO and BI-1 mRNA abundance was significantly increased in barley nec1 plants (Figure 5). Significant over-expression of MLO and BI-1 might result from general activation of cell death-related signaling pathways and systemic immunity responses rather than from activation of particular powdery mildew resistance. Together these observations suggest that nec1 mutation most likely affects PTI and non-host resistance related responses and it is not associated with rapid localized defense responses required to prevent fungal penetration. HR related cell death is suggested to serve in plant immunity as a factor triggering activation of SAR [4, 58]. Spontaneous cell death might elicit constitutive activation of SAR related signaling pathway in nec1. Previously nec1 has been shown to constitutively over-express PR-1a and β-1,3-glucanase  - molecular markers of SAR. This study confirmed the constitutive activation of SA-related signaling pathways in nec1 mutants, since significant over-accumulation of H2O2 and SA in nec1 plants was detected. In Arabidopsis thaliana, non-host resistance against some types of pathogens involves SA signaling [59–61]. In barley, a substantial increase in SA levels has been observed after infection with Pseudomonas syringae pv. syringae, but not after inoculation with non-host fungus Blumeria (Erysiphe) graminis f. sp. tritici  or host pathogen Bgh  suggesting a differential role of SA in barley resistance against different pathogens. Constitutive activation of the SA-related defense pathway may contribute to differential resistance of nec1 mutant against non-host bacteria Pst and virulent host pathogen Bgh. However, the cause for SA over-accumulation needs further investigation, and it remains to be determined, if SA-independent pathways are activated in nec1 mutant similarly to Arabidopsis hlm1/dnd2 mutant. nec1 mutation increased resistance against the non-host bacterial pathogen Pseudomonas syringae pv. tomato applied at high inoculum density and it also inhibited microcolony formation of host pathogen Blumeria graminis f.sp. hordei, but its penetration resistance to Bgh or race non-specific Bgh resistance pathways were not impaired. The differential disease resistance response of nec1 plants might result from the activation of specific resistance pathways differentiating between various types of pathogens. SA-dependent signaling pathways have previously been shown to participate in disease resistance against certain types of pathogens, while not affecting others. nec1 mutant displays constitutive activation of systemic acquired resistance-related signals such as over-accumulation of hydrogen peroxide and SA, as well as over-expression of PR-1. It remains to be determined, if constitutive activation of SA related signaling is the main reason for the differential disease resistance of nec1 mutant. Plants for all experiments were grown in an environmental growth chamber at 22°C under long-day (16 h day, 8 h night), medium light (ca. 150 μmol m-2 s-1) conditions. The barley necrotic mutant nec1 (GSHO 1284) containing a MITE insertion in the gene for Cyclic Nucleotide Gated Ion Channel 4 (CNGC4)  has previously been described as a natural mutant in cv. Parkland . Both cv. Parkland and GSHO 1284 are completely susceptible to powdery mildew. mlo-5 and nec1 double mutant was obtained by crossing accession GSHO 1284 with NGB 9276 carrying the mlo-5 allele in the cv. Carlsberg II background . Plants homozygous for nec1 and mlo-5 alleles were confirmed by genotyping the respective mutations and F4 plants were used for all experiments. Barley accessions GSHO 1284 and Parkland were obtained from USDA ARS National Small Grains Germplasm Research Facility (Aberdeen, Idaho, USA), and NGB 9276 was obtained from Nordic Genetic Resources Center (Alnarp, Sweden). To study nec1 non-host resistance against Pseudomonas syringae pv. tomato, leaves of 14 day old nec1 plants were vacuum infiltrated with a bacterial suspension in 10 mM MgCl2. Bacterial suspension was applied at normal concentration 8 × 104 and high concentration 6 × 107 cfu ml-1, since low concentration inoculum typically applied for infection of host plants can have minor or no effect on non-host species . For mock inoculation 10 mM MgCl2 was used for infiltration. Immediately after infiltration plants were covered with plastic bags to maintain high humidity and kept in dark for 1 h. After an hour plants were transferred to growth conditions described above. Bacterial growth was monitored at day 3 post inoculation by dilution plating of homogenized plant tissue. Leaves were briefly sterilized with 70% ethanol before homogenization. Pseudomonas syringae pv. tomato was obtained from the German microbial type collection (accession 50315). Cell death was quantified by electrolyte leakage assay performed as described by Dellagi et al. (1998) with minor modifications . In brief, plants were vacuum infiltrated with Pst as described above and incubated in dark at high humidity for an hour. Five mm leaf disks were collected and washed with distilled water for 1 h and then transferred to a tube with 6.5 ml distilled water. Conductivity was measured with conductivity meter handylab LF11 (Schott Instruments). Each sample contained 4 leaf disks from 4 plants and at each data point 4 independent replicates were measured. Two week old plants of nec1 and cv. Parkland were inoculated with 10-20 conidia per mm2 from virulent mixed population of powdery mildew multiplied on cv. Parkland. For the characterization of penetration efficiency, infected barley leaves were harvested 48 h post inoculation and cleared for 24 h in 98% ethanol. Penetration efficiency was calculated as a ratio of interaction sites with haustoria formation and the total number of spores with developed appresoria. The overall penetration efficiency for the particular barley line was an average from three replicates containing at least 100 interaction sites each. Bgh microcolony formation was examined on 5 cm long leaf middle segments, which were laid flat on 0.5% agar in water (w v-1) plates with adaxial surface facing up and were inoculated with mixed population of powdery mildew multiplied on cv. Parkland. Each plate contained leaves from both nec1 and cv. Parkland plants to compensate for uneven inoculation. Bgh microcolonies were microscopically scored 4 days post inoculation. Experiment was repeated twice with 14 independent samples per barley line in each experiment. Hydrogen peroxide was quantified spectrofluorometrically . Briefly, 1 g of freshly harvested leaves from two week old barley plants were frozen in liquid nitrogen and ground in 50 mM Hepes-KOH buffer containing 1 mM EDTA and 5 mM MgCl2 (pH 7.5). After centrifugation for 10 minutes at 13000 g, the supernatant was transferred to a new centrifuge tube and an equal volume of chloroform:methanol (volume ratio 2:1) solution was added. After centrifugation for 3 minutes at 13000 g, the upper aqueous phase was transferred to a new centrifuge tube and 50 mM Hepes-KOH buffer solution (pH 7.5) containing 0.5 mM homovanillic acid and 15 U horseradish peroxidase VI was added to a final volume of 3 ml. Samples were incubated at room temperature for 30 minutes before fluorescence measurements were taken (excitation at 315 nm, emission at 425 nm). Fluorescence was measured with a FloroMax3 spectrofluorometer (Horiba Scientific, Japan). For quantification of the H2O2 a standard curve with a range of 100 μM - 1 nM was applied. Sample correction for quenching was performed by adding a known sample amount to a 10 nM H2O2 solution. The SA content in leaf tissue extracts was analyzed using reverse-phase high performance liquid chromatography (HPLC). Each sample contained leaf tissue from 3 two week old plants. Samples were prepared essentially as described . Briefly, 0.45 g barley leaf tissue was homogenized in liquid nitrogen and sequentially extracted using 90% and 100% methanol. Extraction was repeated twice and two supernatant fractions were pooled and dried. The residue was resuspended in 1 ml of 5% acetic acid. As an internal standard for SA recovery correction, samples were selectively spiked with 50 μg per g FW 3-hydroxy benzoic acid (3-HBA) . For the quantification of free SA, 1 ml of ethylacetate:cyclopentane:isopropanol (50:50:1) was added. The sample was thoroughly mixed and the upper phase (approximately 1 ml) was transferred to a new 2 ml tube. The aqueous phase was then re-extracted, as described previously, and both organic phases (approximately 2 ml) were pooled. The resulting solution was vacuum-dried and thoroughly resuspended in 0.9 ml of mobile phase. This suspension was filtered through a 0.20 μm filter. The aqueous phase containing the SAG fraction was acidified with HCl to pH 1.0 and boiled for 30 min to separate free SA from conjugated SA. The released SA was then extracted with the organic mixture and treated as above. Chromatographic analysis was performed on a modular HPLC system, Agilent 1100 series, consisting of quaternary pump, autosampler, column thermostat and both UV and fluorescence detectors (Agilent Technologies, Germany). Separation was achieved on a Zorbax Eclipse XDB-C18 (Agilent Technologies, Germany) column 4.6 × 250 mm, 5 μm. Column temperature was maintained at 40°C. The mobile phase was prepared by mixing acetonitrile:20 mM NaH2PO4 (pH 3.0 with acetic acid), in a volume ratio 25:75. The mobile phase flow rate was 1.0 ml min-1. Injection volume was 100 μl. The UV/VIS detector was set to 237 nm and 303 nm and the fluorescence detector to an excitation wavelength of 297 nm and an emission wavelength of 407 nm. Results were evaluated by a ChemStation Plus (Agilent, Germany). For RNA extraction, 5 cm long segments of cotyledon leaf from two week old plants of necrotic mutant nec1 and parental cv. Parkland were frozen in liquid nitrogen immediately after harvesting. Total RNA was extracted from frozen leaf tissues using Trizol reagent. Each RNA sample was extracted from a pool of five plants, and three biological replicates of each barley line (15 plants in total) were used for expression analysis of BI-1, MLO, HvRACB and HvRbohA genes in nec1 and cv. Parkland plants. Integrity of the extracted RNA was monitored using non-denaturing agarose gel electrophoresis. Quantity of purified total RNA was monitored using spectrophotometer NanoDrop ND-1000 (NanoDrop products, USA). One to two μg of the extracted RNA was treated with DNaseI (Fermentas, Vilnius, Lithuania) following the manufacturer's instructions and afterwards purified using chloroform-ethanol extraction. cDNA was synthesized with oligo (dT)18 primers in a total volume of 10 μl containing 1 μg of total RNA using the RevertAid H Minus First Strand cDNA synthesis kit (Fermentas, Vilnius, Lithuania). For quantitative real-time PCR, aliquots of cDNA were amplified on an ABI Prism 7300 instrument (Applied Biosystems, Foster City, CA, USA) using the Maxima SYBR Green PCR kit (Fermentas, Vilnius, Lithuania) in a total volume of 20 μl containing 2 μl of cDNA and 0.3 μM primers (Table 1). The reaction was carried out as follows: initial denaturing step for 15 min at 95°C followed by 35 cycles of 15 s at 94°C, 30 s at 60°C and 45 s at 72°C (data acquisition step). Standard curves for the quantification of the transcript levels were calculated from serial dilutions of appropriate cDNA fragments amplified from cv. Parkland. Transcript levels of the studied genes were expressed as a percentage of HvGAPDH transcript value in the same sample. Combined values of two technical replicates of the three biological replicates (n = 6) were used to calculate the average values and standard deviations. Analysis of variance (ANOVA) of transcript abundance between the mutant and the corresponding parent was done in Microsoft Excel (Redmond, WA, USA). The study was funded by Latvian Council of Science grant Z-6142-090, European Social Fund project 2009/0224/1DP/1.1.1.2.0/09/APIA/VIAA/055 and University of Latvia grant ZP-59. AK and LK are recipients of the European Social Fund scholarships (projects 2009/0138/1DP/1.1.2.1.2/09/IPIA/VIAA/004 and 2009/0162/1DP/1.1.2.1.1./09/IPIA/VIAA/004, respectively). Authors are grateful to the anonymous reviewers for their suggestions that helped to improve the manuscript. AK designed and performed the study and drafted the manuscript. KKS and LK performed the disease resistance tests and gene expression analyses. IN performed HPLC analysis and helped to draft the manuscript. NR designed and performed the study and wrote the final manuscript. All authors have read and approved the submitted manuscript.